*Christmastime is always filled with moments that make for good memories. And Alane Ecklund Church has a holiday memory she will always remember. Today.com reports the Illinois woman got more than she bargained for when she received a package from her brother-in-law that came with a little something extra. The something extra turned out to be a gift from “Barack, Michelle + the girls,” according to the handwriting on the gift tag. The Obama box, which was opened by Church’s husband on New Year’s Day, was actually meant for Eleanor “Mama Kaye” Wilson, a close friend of the Obama family who is the godmother to Sasha and Malia Obama. The box was one of many gifts found in the brother-in-law’s damaged package, which was finally delivered to Church on New Year’s Eve. Mama Kaye’s gift? A personalized book of photographs. “It’s very special. Private moments of their year of 2013 together,” said Church, who went ahead and phoned Mama Kaye after getting her contact information. 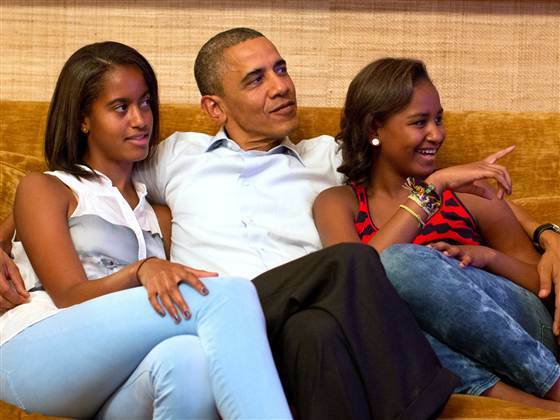 In addition, Church discovered that Sasha and Malia make a memory book every year for their godmother. For anyone wondering if the gift was really what it is, Church confirmed its legitimacy with TODAY anchors and added that it would soon be making its way to Wilson and her family. Despite obtaining a real find, Church was not in favor of showing any of the photographs inside the memory book. “We’re sort of wanting to keep it private for Mama Kaye,” she said. And the U.S. Postal Service wonders why they are in debt and barreling toward insolvency! You can’t even deliver the FIRST FAMILY’S Gifts to the Correct location UNDAMAGED! I’m Going to Miss the Postal Service!